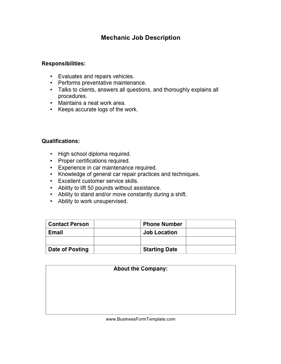 Whether hiring a new employee or simply bringing everyone up to date on new requirements, use this mechanic job description to address responsibilities and qualifications for working in an auto shop. Talks to clients, answers all questions, and thoroughly explains all procedures. Maintains a neat work area. Keeps accurate logs of the work. Experience in car maintenance required. Knowledge of general car repair practices and techniques. Ability to stand and/or move constantly during a shift.